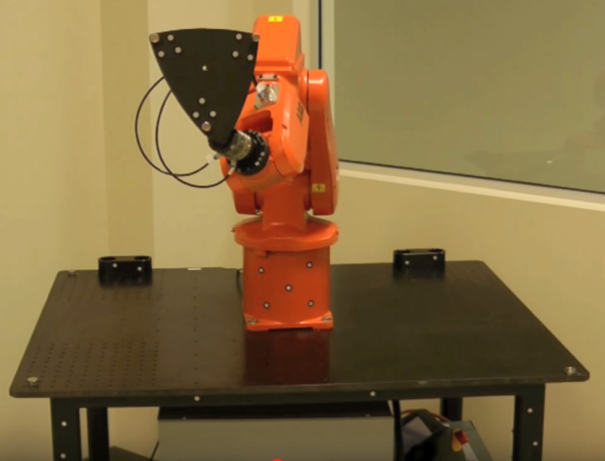 Video: The following video shows the calibration procedure by calibrating a KUKA robot using a laser tracker measurement system https://www.youtube.com/watch?v=DWSqZAFaJ2I. Tip 2: Approximately move any reference frames or tool frames by holding the ALT key and SHIFT+ALT key respectively. 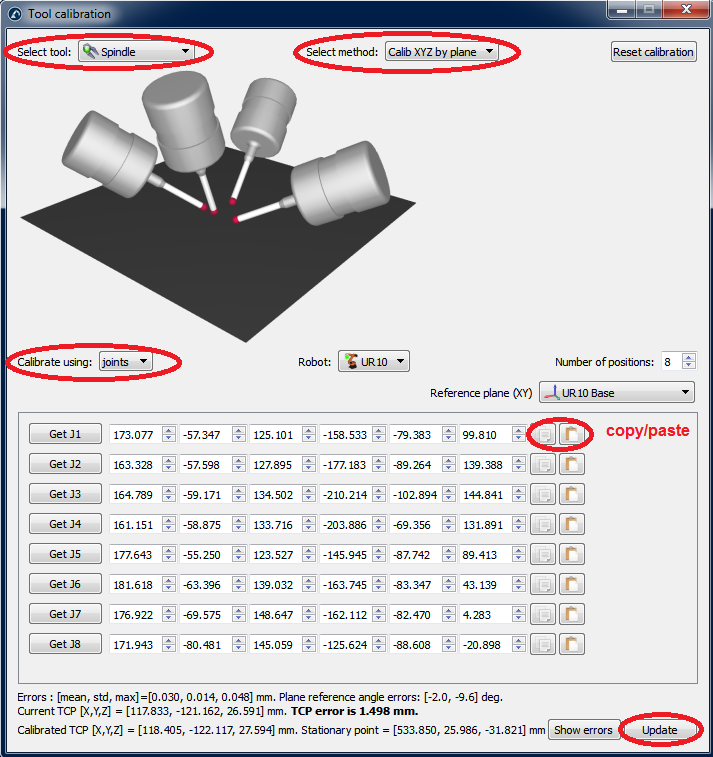 Alternatively, double click the reference frame and input the right coordinates. 1. The calibration tools are named “CalibTool id” and the id are numbers start at 1 (if there are 3 calibration tools we must have “CalibTool 1”, “CalibTool 2” and “CalibTool 3”. 2. 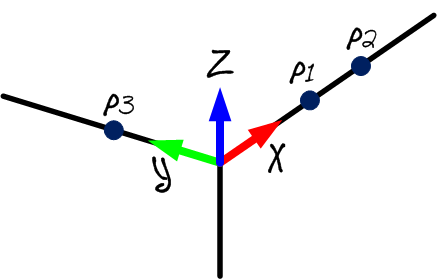 The Measurements reference frame directly depends on the robot base. For now, we can use an estimate of this reference frame. 3. The Tracker reference directly depends on the Measurements reference. The tracker reference must be an approximate position of the laser tracker with respect to the measurements reference. 4. The Robot calibration project is present in the station and all the measurements that we are planning to take are free of collision and visible by the laser tracker (select show for each group of measurements). 5. If we want to automatically check for collisions we must use the name tag “collision” in every object that we want to use to check collisions. It is recommended to use a tool around 25% bigger than the calibrated tool for collision checking to safely avoid collisions. A new message will pop up once the algorithm finishes. 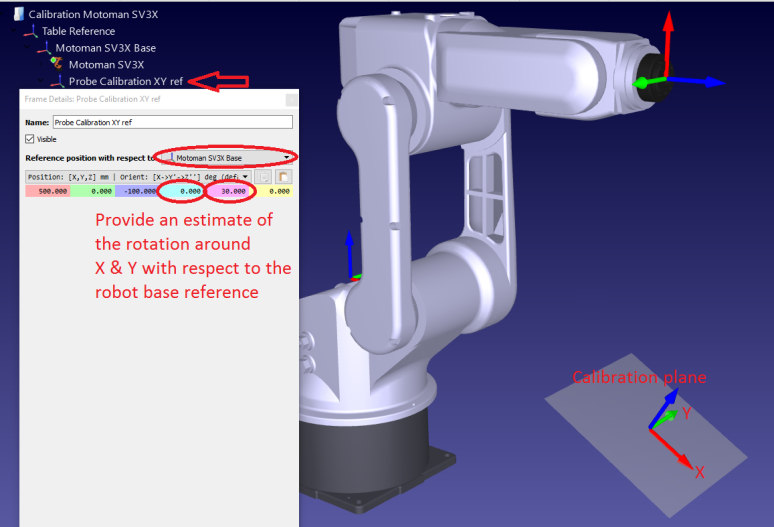 We can select “Calibration” to use the 60 measurements for robot calibration. 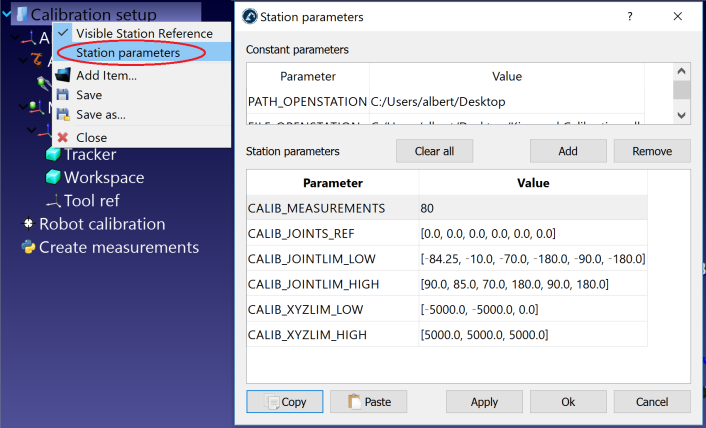 We can re-execute the same script to generate another set of measurements for validation. This step is optional but 80 measurements are recommended for validation purposes. 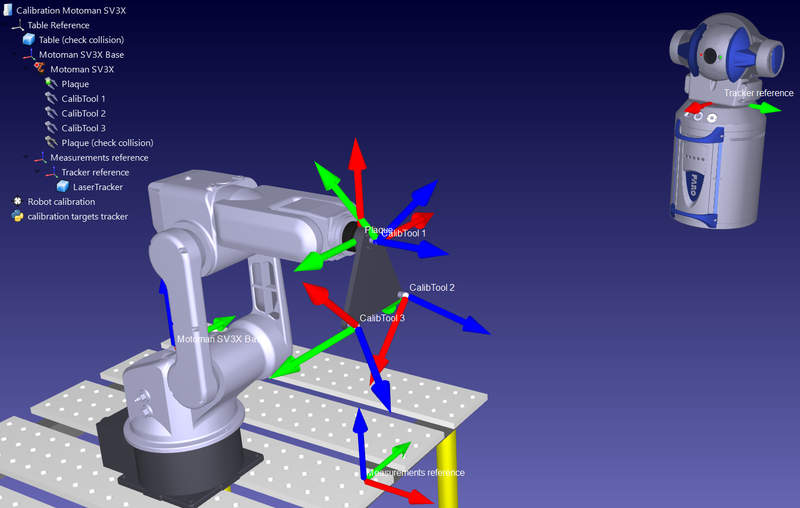 It is required to connect the laser tracker and the robot to the computer to automate the procedure of taking measurements. It is also recommended to measure a reference frame through three points in case we move the laser tracker (this step is mandatory if we want to recover the home position for axis 1, see Annex II for more information). It is required to attach at least one SMR target (three or more is recommended), as shown in the following images. It is also convenient to use 3 nests as a reference frame if the laser tracker must be moved. The following subsections must be sequentially accomplished to be ready to start taking measurements. Connect laser tracker ». A new window should open. b. 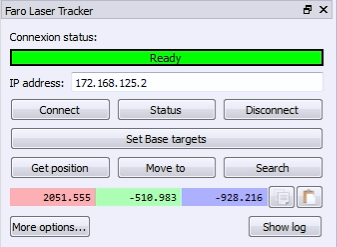 Set the IP of the laser tracker. c. Click the “Connect” button. If the connection is successful you should see a green message showing “Ready”. The window can be closed and the connection will remain active. Important: The position of the virtual robot should exactly match the position of the real robot if we select “Get current joints” and “Move to current joints”. Some robot settings may be incorrect if this is not the case. 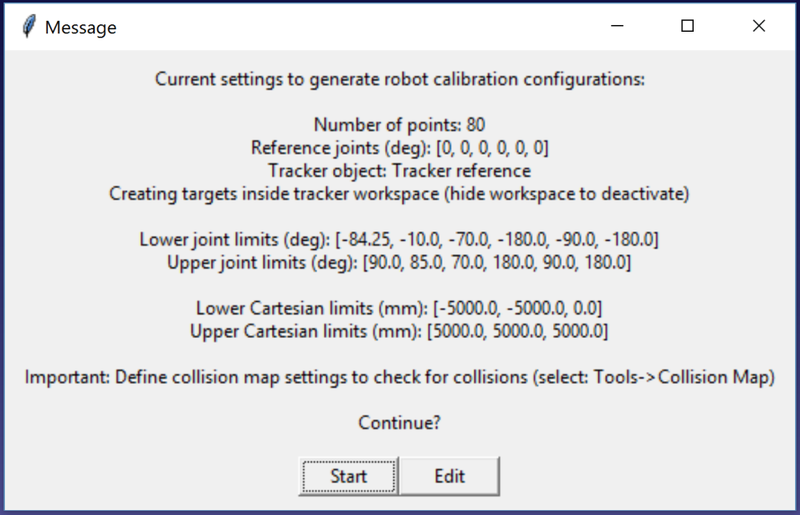 It is recommended to measure a calibration reference frame, attached to the robot base, this will be helpful if we want to move the tracker during calibration or compare two robot calibrations. 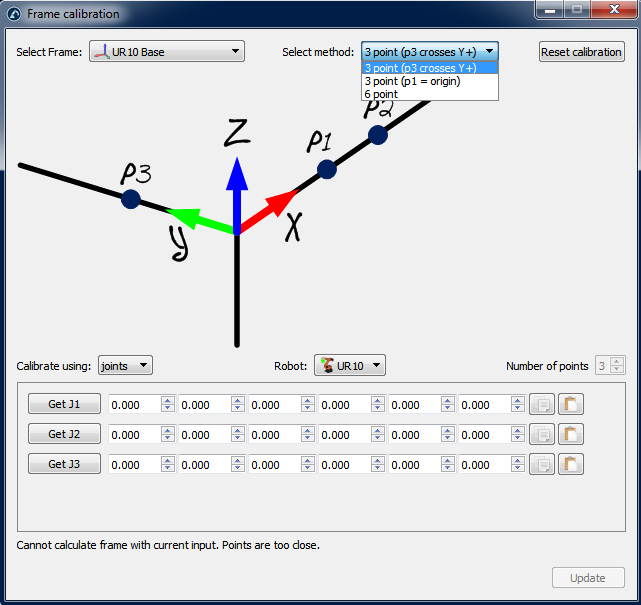 The calibration reference frame must be defined by 3 tangible points. We can skip this step if we are not going to move the tracker with respect to the robot or we do not need to recover the home position for axis 1. In this case, the reference of the laser tracker will be used. Important: This step is important if we want to recover the home position for axis 1. Refer to the Appendix III for more information. 2. 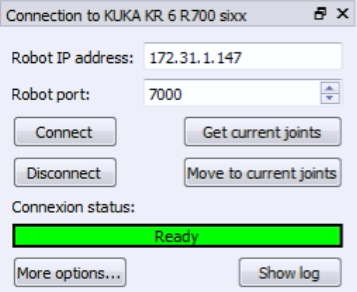 Set the IP of the laser tracker and select connect (if laser tracker is not connected). 3. 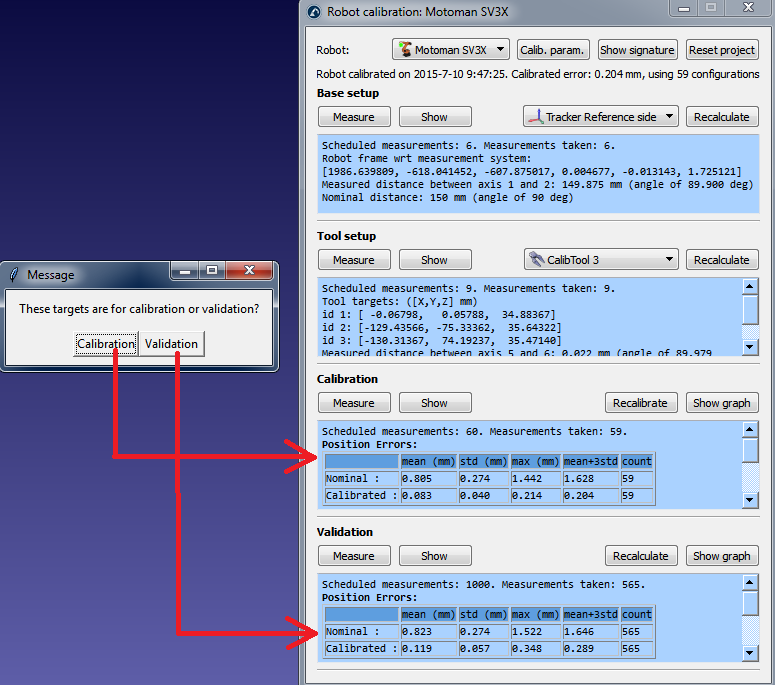 Set the calibration reference and the tracker reference as shown in the image. The calibration reference is also known as “Measurements reference”. 4. Select Set Base targets. 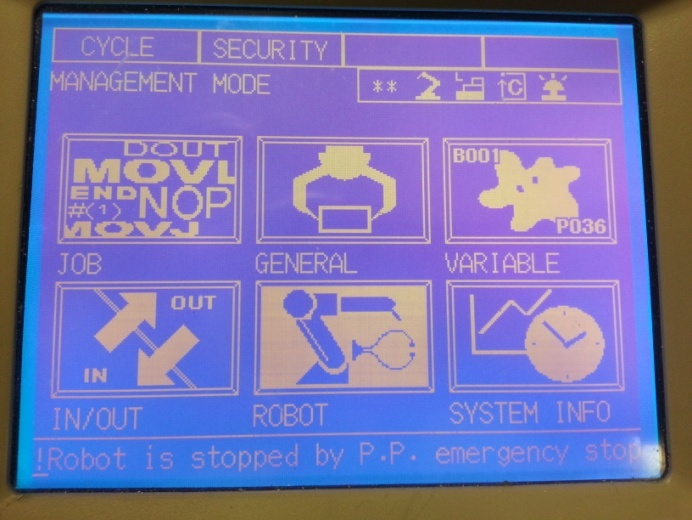 RoboDK will guide the user with the menus shown in the next image. 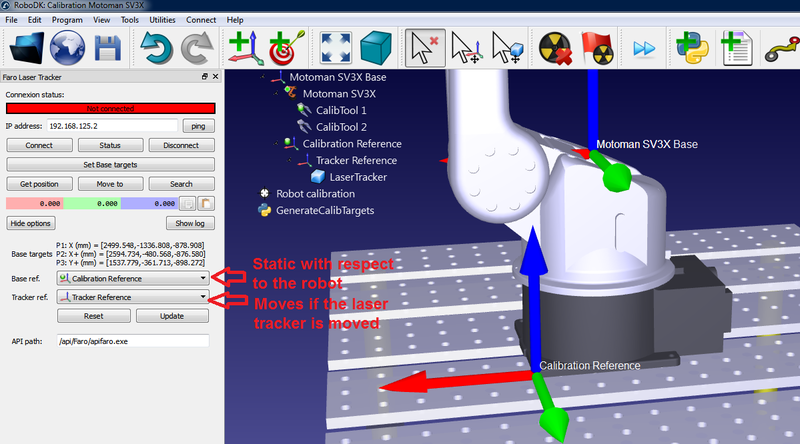 The position of the laser tracker will be updated automatically with respect to the calibration reference when the procedure is completed. 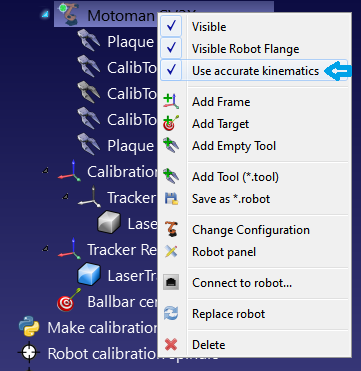 The following video shows how to perform this calibration in 20 minutes: https://www.robodk.com/robot-calibration#tab-lt. 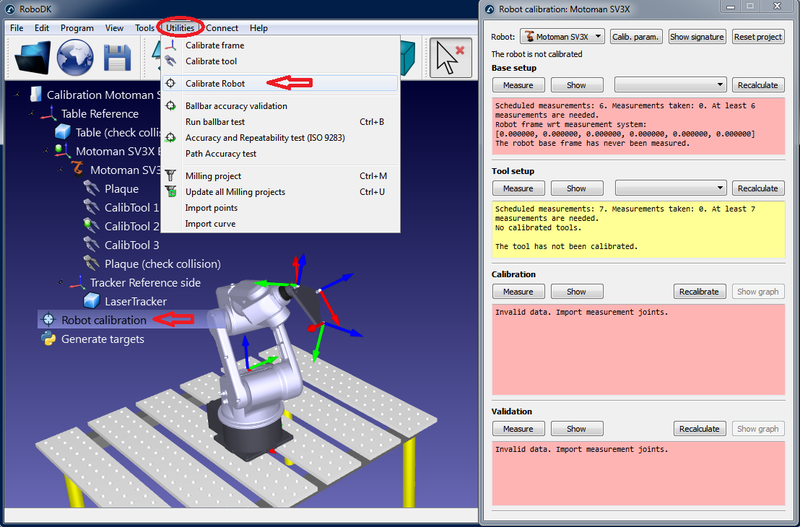 The validation measurements (step 4) are not mandatory to calibrate the robot, however they provide an objective point of view of the accuracy results. 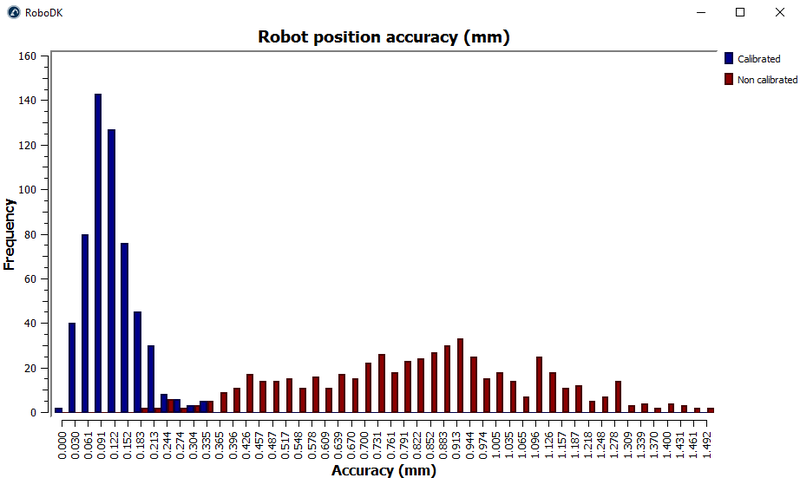 It is also possible to see the impact of calibrating the robot in one area and validating it in a different area. 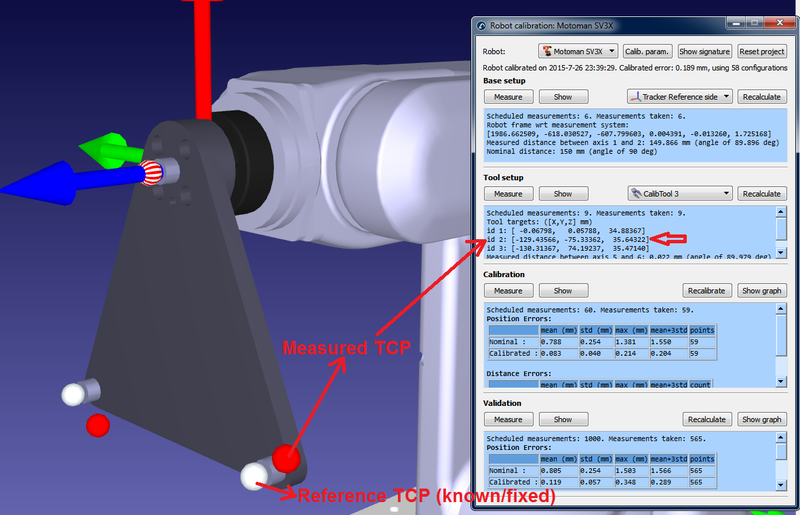 Measurements 1-6 can be performed anywhere in the tool flange as long as we measure the same target for the 6 measurements. 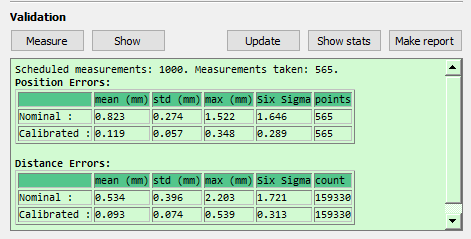 After that, every TCP that we want to measure will add one measurement for the same TCP, in this case, we have 3 TCPs so 6+3=9 measurements in total. We can double click a measurement to continue measuring from that position. Add empty Tool”) and select “Recalculate”. A new window will appear and we must select the “id” of the tool depending on the order that we took the measurements. We can repeat the same procedure to update as many TCPs as we need (in this case 3 TCPs). The id of the tool will be automatically detected if the name of the tool ends with a number. Finally, we can select Make report and a PDF report with the information presented in this section will be generated. 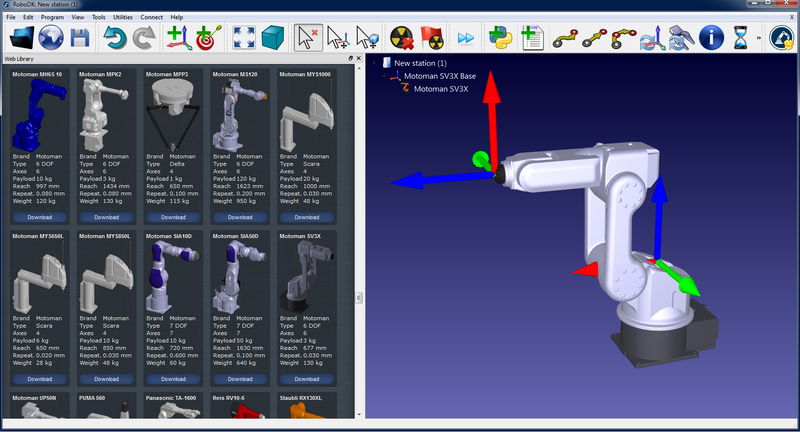 As an example, we must follow the next steps to update home position for Motoman robots. Important: We should not run this procedure twice. Otherwise we will be setting a different home position. We must first run the program “MASTERING” to bring the robot to the new home position. 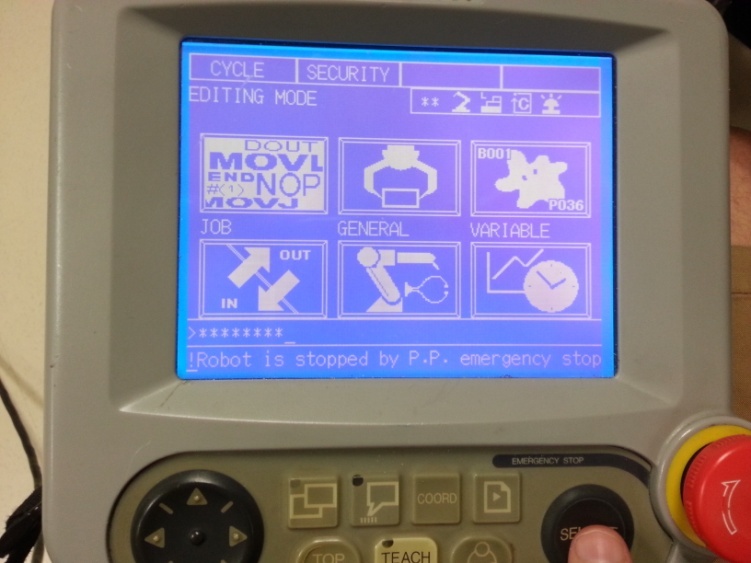 Once the program is in the controller we must log in as “Management mode” (password for Motoman robots is usually 99999999) and we need to be in Teach mode. The following images show the steps that must be followed. 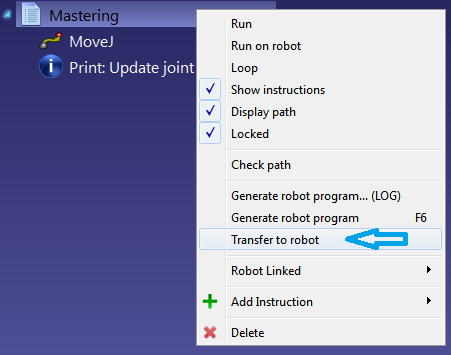 Make sure to update the home position for all robot joints. Once the home position is set, we must delete the robot program that brought the robot to the new home position. Important: We should not execute this procedure twice. 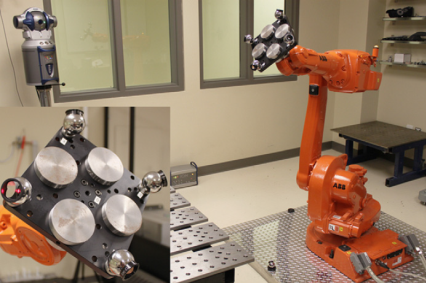 Robot calibration requires measurements to be taken from the robot with a measurement system. To take these measurements it is required a Faro laser tracker that communicates with a computer. 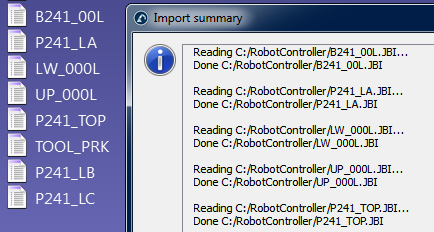 The communication is done through a driver exe file that can be run in console mode. For example, Faro provides a free application called “Tracker Utilities”. 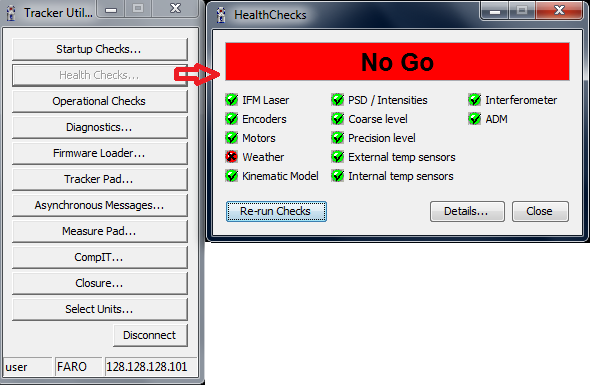 This application can initialize the laser tracker and perform some health checks, among other things. 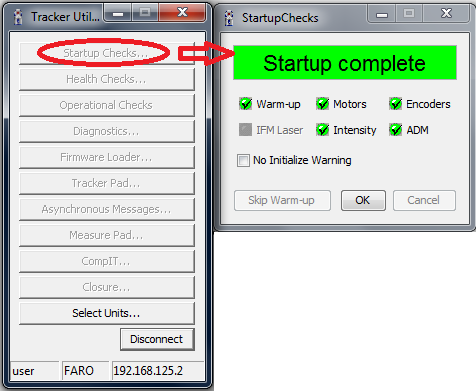 To initialize the tracker we should start the “Tracker Utilities” application, connect using the tracker IP, then, select “Startup Checks”. When the tracker initializes, we should place a 1.5’’ SMR target in the “home” position before initialization. Otherwise, the green light will flash after initialization and the measurements will not be valid. Once the initialization is done we should read the “Startup complete” message, as shown in the following image. 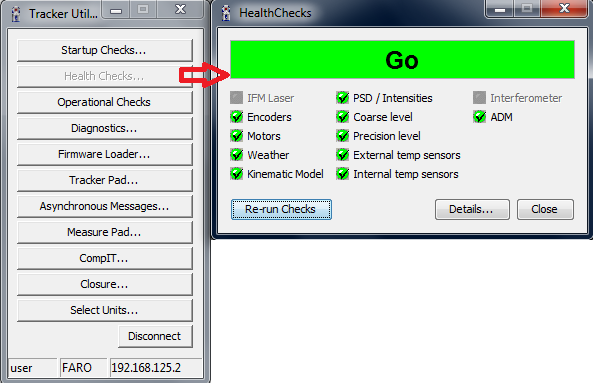 If we experience problems with the tracker, we can run some health checks by pressing “Health Checks…”. The next two images show a success check and a failed check respectively. Sometimes, problems are solved after reconnecting the cables and rebooting the laser tracker. Note: It is recommended to perform a tracker Self compensation from time to time. 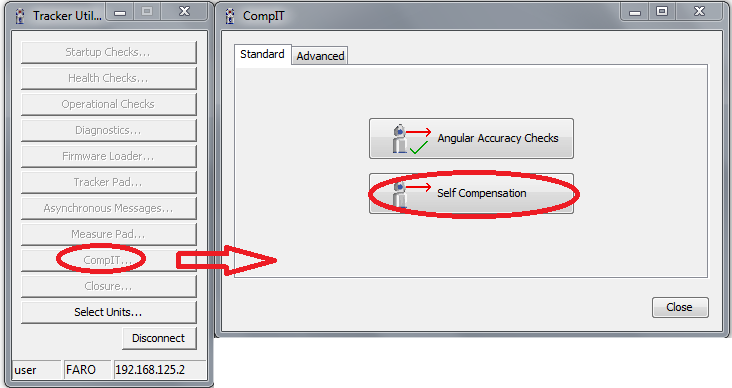 This compensation uses some reference points in the tracker head to auto calibrate the measurement system. 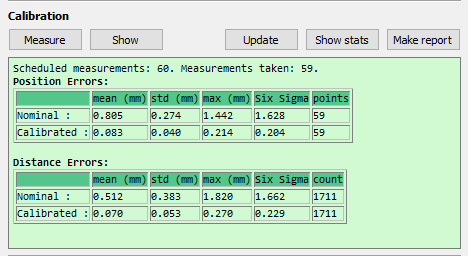 Alternatively, we can run some angular Accuracy Checks to validate the accuracy of the laser tracker. Finally, we can use the “Measure pad” to take some measurements. The laser tracker can follow a target and measure the XYZ position at a rate of 1000 Hz. 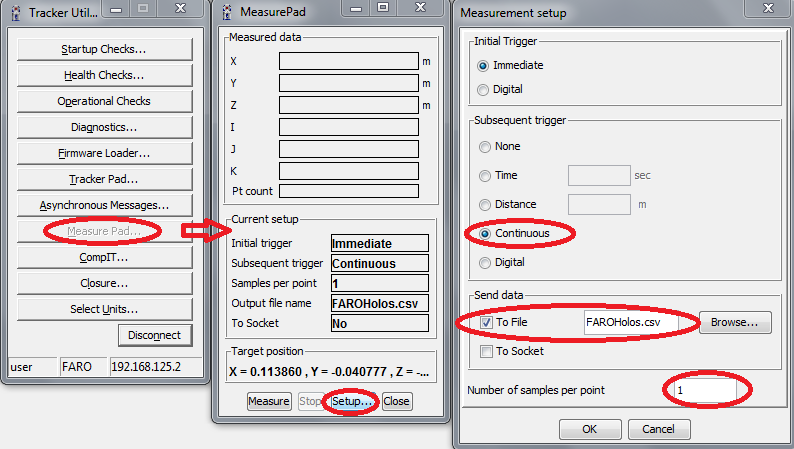 If we set 1 sample per point and continuous trigger the tracker will record 1000 measurements per second in a CSV file. 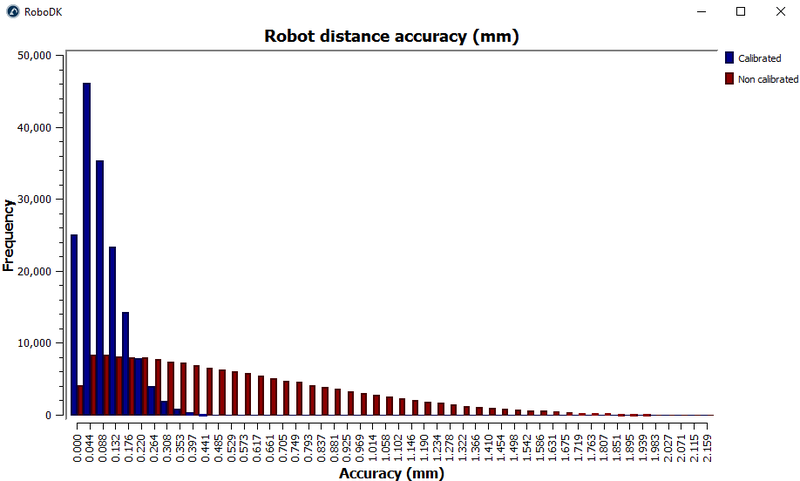 We can use this feature to measure a robot path and use the RoboDK’s path accuracy check to check the accuracy, speed and acceleration along the path.